When the pioneers first arrived in America, one of the first things they needed to do was to build a house where the family could live. These people always settle in a place where there were plenty of trees, so it would be easy for them to build log cabins. Building log cabins doesn’t require much resources, just trees and an axe or saw. They didn’t need metal nails or spikes to hold them together and they could build log cabins fairly quickly. 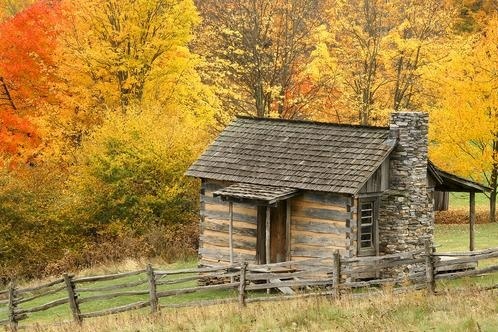 Most log cabins were simply made as one room where the entire family would live. One of the first things the settlers had to do was clear a plot of land where they could build a house. They would also need some space around the home where they could plant a garden, build a barn, and keep some animals like chickens. It’s a regular chore for settlers to cut down trees and remove stumps to clear the land. After clearing the land, they would need to cut down trees to get all the logs they needed. Settlers need to find trees with straight trunks that would make good logs for building cabins. Once they cut the trees, they would trim the logs in the same length. Of course, they would strip the bark off the logs as the bark would rot easily. With the absence of nails, forming notches at each end of logs is a must to allow it to fit snuggly locking together. If only one man was building the cabin, he could only built around a height of only 6 or 7 feet tall. This is because he could only lift a log that high. If he had help, then walls could be a bit taller. Each side of the log cabin was typically between 12 and 16-foot long. Once the walls and the roof were completed, they would seal the cracks between the logs with mud or clay. This was called "daubing" or "chinking" the walls. When the log cabin is fully erected, settlers do some finishing touches like placing a stone fireplace at one end of the cabin. This would keep the family warm during cold season and a place for cooking. Log cabins were usually built with one or two windows to let light in, but during that time there was a scarce supply of glass. So the settlers used greased paper to cover the window. The floors were generally earthy, but sometimes they use split logs for the floors. The settlers weren’t capable of furnishing the cabin with furniture, especially when they first moved in. They might have a small table, a bed, and a chair or two. Oftentimes they would have a chest that they brought with them from their homeland. The first log cabins in the Americas were built by emigrants from Sweden and Finland where log cabins have been built in these countries for hundreds of years. Today, with the use of modern resources, log cabins are now built to last a lifetime.